Vacation fun is "bountiful" at this hidden Wears Valley Cabin - BOOTLEGGER'S BOUNTY! Located just one mile from the heart of scenic Wears Valley, and tucked at the end of the community road - BOOTLEGGER'S BOUNTY offers guests a perfect mountain escape! Enjoy your favorite beverage from the covered wrap round porches with valley and mountain views, or relax in the private bubbling hot tub. Inside, a vaulted main living area includes a stone/gas fireplace, queen sleeper sofa, LED TV, and recliner. The room opens to a full kitchen with breakfast bar and log dining table for 6. The main floor King master bedroom includes an in-room jacuzzi tub. 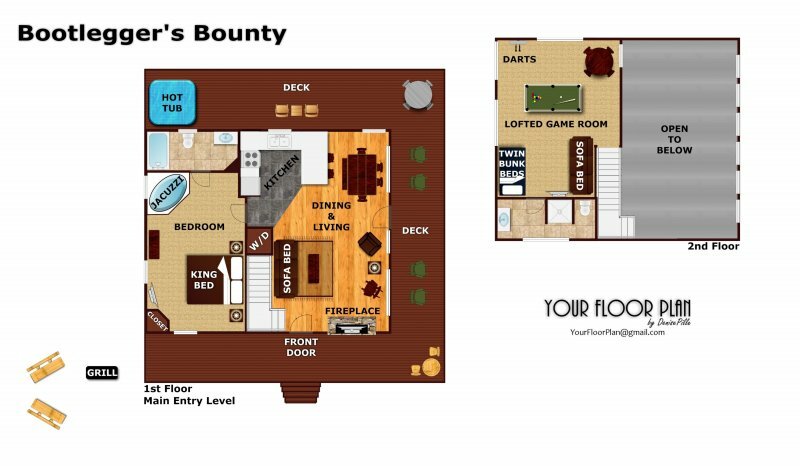 Upstairs, the lofted game room with pool table and LED TV has bunk beds and a queen sleeper for extra guests. Bring the whole gang - there's room for up to 8 of your favorite people in this incredible 1 bedroom, 2 bath cabin! Smuggle your family down to the mountains this year in BOOTLEGGER BOUNTY! We really enjoyed this cabin so much!! This trip was to celebrate our 1st anniversary!! And we have to say we could not have picked a better place to stay!! We absolutely loved our stay at Bootleger Bounty!! We both have been to Tennessee many times and have stayed in several cabins, but this one by far was our favorite!! The view was beautiful and Im sure in the fall its breath taking. Thank you for sharing your property with us!!! The cabin was amazing and we will definitely be coming back! The driveway was a little scary be we managed to make it up lol. I have referred American patriot getaways to all of my friends. This is our second time getting a cabin with you guys ( first onewas cabin on the hill or cabin in the woods ..cant remember.. last year ) and its always been hassle free and pleasure to deal with! Keep up the good work! Very clean and beautifully decorated. Easy to find. Driveway a little steep. Beautiful cabin we absolutely loved it here. Was our 1st time in the area so we were out on the town a lot and wish we had more time at the cabin. So much to do that maybe we will just have to come back . Till next time, Thank you for the great experience. There are so many beautiful cabin rentals, even tho this one was superior, i think we would like to try others. Coming back again to the Smoky Mountains is my dream vacation and this past 10 days ranked right up there with the best trip ever. Your interior decorating was EXCELLENT! I Loved the kitchen table and chairs so much that before I left Pigeon Forge on the way home at the 12th furniture store that we visited I found the exact dinette set and purchased it for my home. Driveway was a bitmuch but my husband and his Cummins truck had fun. I stayed with my wife and 2 children and we absolutely loved it!! The best part of this cabin is you get the best of both worlds...a beautiful mountain and valley view off the front deck, and a wooded view off the back. The cabin was impeccably clean andthe Patriot staff was very nice to deal with. We even had a bear visit us on the first morning. I've stayed in several cabins, and I could not recommend this one highly enough. It's listed as a 1 bedroom, but we had 4 of us and it was VERY spacious. We also had dinner guests one night, so we had 8 people at dinner in the cabin and it was plenty big enough. Book this cabin!! Awesome experience. What can I say - Bootlegger's Bounty has been by far our favorite cabin in all our 33 years coming to the mountains! Attention to detail is amazing! I don't know where to begin - the deck that wraps around forever with so many sitting options - the AMAZINGview of the mountain & valley - the open, spacious floor plan - king size bed that felt like sleeping on a cloud - the open loft, game area(with cards, games, darts, pool, tic-tac-toe!). This was our 1st time to stay in Wears Valley area, so we exploredthe area - Cades Cove(saw 4 bear! ), the shops - ate at Elvira's but we also ventured into Gatlinburg and PF. Breakfast at Crocketts(shared a Black Bear Skillet & still took home food! ), walked to the Parkway - love The Village(Donut Friar & Pancake Pantryis a must!) Went to the Island - took in the Show Hatfields & McCoy - ALWAYS have to shop at 3 Bears General Store - took in nature and RELAXED! We sure are going to miss your little piece of Heaven in the Smokies! Thank you for sharing with us! Our experience with American Patriot was excellent. We intent to use American Patriot Company in the future and we hope to stay at Bootleggers Bounty in the future. Your cabin is beyond beautiful! We genuinely felt like we were at home - it was amazing. We take this girls trip every year & we look for somewhere new to stay- our expectations were exceeded. The bed felt like you were sleeping on a cloud & the hot tubprovided the perfect way to end the night. We were quite suprised just how far up in the mountains we were. Thank you for sharing your home with us so we could relax & unwind. This is somewhere we could for sure stay again! We will definitely recommendthis place to people we know. We absolutely LOVE your cabin!! It was perfect for us for our weekend getaway. I love the decor, size, pool table & games! It was the perfect setup for a cozy, relaxing Super Bowl experience! We definately will be back- probably yearly! We did not wantto leave! Thank you for sharing your cabin! We had a very nice time! You can tell you put a lot of thought into the cabin. We enjoyed driving to Cades Cove Loop and saw lots of deer, a baby coyote, and asow with cubs. We also enjoyed eatting at the Apple Barn and we went to Dolly Parton Stampede. Wehad such a great time we decided to extend our stay. Unfortunately, Bootlegger's Bounty was already booked. Lucky people! Thank you for putting so much thought into the cabin. Thank you for sharing your beautiful home! We are from Western Kentucky. This was a long weekend getaway for our 12th anniversary. It was also our first trip to the mountains. The cabin was perfect and so relaxing. We enjoyed the beautiful views at nightfrom the hot tub, playing pool, and just relaxing in front of the fire. Would definately like to return to the Bootlegger's Bounty! We arrived here on the 16th while the snow was falling. We did not leave the cabin our entire stay. The decor is beautiful and stocked with all the things a person might need. Will definately be back and also recommend Bootleggers to family and friends. We absolutely loved the cabin. The pictures online did it no justice! Everything about the cabin is wonderful & thoughtful. What beautiful decor and it was stocked with all the supplies we could possibly need. We will definately be coming back andrecommending to all our friends. This was our first big family vacation and we made wonderful memories here. We tooke a trip to Knoxville and had a pretty good time, bowling at Maple Hall & amazing BBQ at Sweetpeas. We look forward to coming back soon! We were lucky enough to be here for the first snow of the season, everything is lovely! I really love your cabin, special thoughtful touches everywhere make fora cozy vacation and we appreciate the games, the nice soaps, the extra blankets. I love thedecorations especially the bear claw towel hangers. They are adorable. Everything is perfect. Thank you, we will be back!